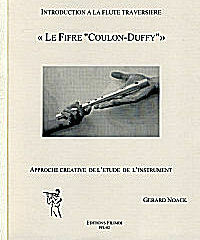 Workshop Coulon-Duffy thurstday evening !!! The famous hongarian flutist Gergely Ittzes liked our aluminium flutes very much. Annick Sarrien-Perrier (Editions Robert Martin) seduced by our pedagogic flute. at the Coulon-Duffy boot in Paris. Pierre Coulon and Gerard Noack playing on Coulon-Duffy fifes ! Promotion of 2 new audio-cd's of "Ensemble Quartz". The parts for fife are played on a Coulon-Duffy fife ! In order to respond to a lot of demands of music teachers flute, a morning session is organised dedicated to the pedagogic work of the well-known Belgian flutist Gérard Noack. He is the autor of 2 courses ment for the young students who are not yet mature enough to play the large flute. One course is specially dedicated for playing on a Coulon-Duffy pedagogic flute.These courses provide a creative formation which is the result of the considerable pedagogic experience of Gérard, as well with novices as with future professional flutists. Gérard Noack will entertain you about his approach, the choice of the excercises, and especially the art to transform this basic flute training in a nice and enjoyable education, very useful for young artists to build their musical future on. In 5 gardens in Schoten (Antwerp), 5 folk-groups will entertain us the whole day, starting from 11 am (www.folkintgruun.be). We are going to walk from garden to garden, and the 'Kustbroeders' from Dunkirk will accompany us while playing on their Coulon-Duffy flutes. An appointment not to miss !